I posted a link on my Facebook page to my recent posting about pruning basil, and a friend added a Comment that her basil had died in the drought, the neighborhood farm stand was fresh out of the herb, and would I consider selling her a few sprigs. I also learned on Facebook that our friend had taken a spill while weeding her garden on Friday. I gave Vivian a call Saturday night. Yes, she’s doing fine, she insisted–no bones broken. “I was lucky to tumble into some weeds and not onto the edge of the sidewalk,” she explained. “I was tugging on a clump of ‘wire grass’ when it decided to give up.” She said she was grateful that she didn’t land on the concrete on her hip that hasn’t done well since joint replacement several years ago. “Well, Vivian,” I said. “I don’t sell my veggies. Will you be home Sunday morning so I can bring you some basil?” She said she and her husband, Curt, would be there and that she would love some to make some pesto. Sunday morning Curt welcomed me to their “down-sized bungalow,” as Vivian calls it, when I drove up in my pickup. Vivian came down the steps from the kitchen to join us in the shade of a backyard tree. 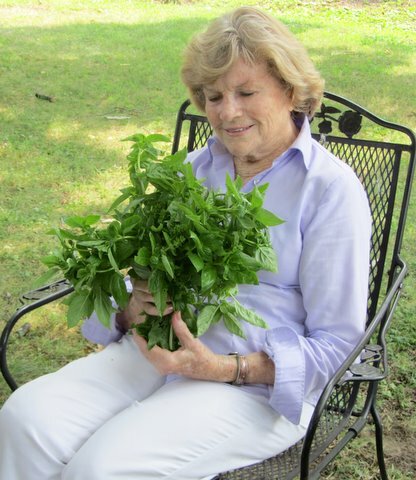 “Here, a bouquet just for you,” I said as I handed Vivian the basil I had cut that morning. She seemed so appreciative, so happy, as she admired her bouquet. We chatted for a bit and I took my leave with many thanks—their thanks for the basil, raspberries, and tomatoes and my thanks for friends like Vivian and Curt, who are four score plus in years and continue to tend their garden of flowers and herbs and care for their lawn. If you have extra produce, give some to a friend, a neighbor, an organization that accepts produce on behalf of those in need. If you live in Maryland or the District of Columbia, CLICK HERE for some ideas of where you might donate to an organization. If you live in another state, perhaps the link will give you an idea for sharing in your town or city. Grow It, Eat It, Give It.